During my free time I setup a station and activated 10 to 80m on CW. My callsign has just been issued 12 hours before my departure: 9G5MM. All other QSLs will be send out via bureau through GlobalQSL. Printing process at GlobalQSL for all QSOs initiated September 30th 2008. LoTW: all QSOs uploaded August 27th 2008. 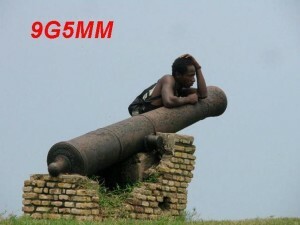 Online log contains all QSOs made from 9G5MM. Just returned home from Ghana. My stay in Ghana, together with my work projects, peaceful and friendly people in Ghana and my ham radio experience made this trip a lifetime experience. I recommend everybody to visit that country. Don’t hesitate to contact me for any question. And no doubt: I will return to that place! My flight went well, just 5 hours before the flight I went of the waiting list a got a confirmed seat. Could manage to bypass every single weighting machine with my (25kg handlugagge). And thanks to Lufthansa being generous with my regular luggage. Today I will be my last chance to go on air. Our projects have been finished and we leave Kumasi tomorrow morning, 07:00pm local time. Another bus ride will bring us to Accra, the capital city of Ghana. I am still on the waiting list for my flight back to Frankfurt and hopefully I can convince the check-in staff to get me a confirmed seat. If that does not work aout I have to stay another day in Accra. I am sorry for not being able to attend the WAE-CW but that’s live. Will post a final comment when I am back home and will also upload the latest QSOs to the online-log. Thanks to everybody who called in. This night I woke up at 03:00 local time (=GMT) to work Ws. Unfortunately heavy 5+20db noise level from 1.8 to 14 MHz. It must be an artificial one since once a minute it disappeared for some seconds. Could not yet find out what it causes. I have had the same trouble the other night. Need to figure out what machine or system runs at that time and (fortunately) not during daytime. I have been returned form a weekend in cape coast. Nice area, however, beaches are unfortunately full of trash from people. Humidity is extremely high and industry seems to be not well developed in this area. After I turned on my radio Sunday evening I was surprised by very bad conditions. Just very weak signals and my CQ calls just went to out with no response. 40-160m noise level is too high to work on these bands. This would require possibly beverages and better filters within the radio. Just around dinner time 🙁 some good rates on 18 MHz. An hour after that, the band died. I tried on 10MHz even without great success. Next time I have to bring a beam. Walked to an internet café to look at WWV data: no surprise seeing SFI=66 and K-Index=4. That makes life even harder. With my limited time and these conditions I will hardly reach my goal of 10.000 QSOs. But don’t mind, I’ll keep trying. I think I got my Laptop fixed. Seems that the Ctrl-Key stuck in permanently. Some peace of goolge desktop search might have also caused it. Hopefully I can manage to keep running. Not much activity on 18/14Mhz this morning, could not really create a pile up. Will be not on air the upcoming weekend, we are doing a trip to Cape Coast for sight seeing and relaxing. Shall be back Sunday evening. Murphy is also around in West Africa. This morning my Keyboard went somehow locked so that I cannot login anymore. Tried to drill down the problem by reboot and figured out that it seems not the hardware having the problem since the hardware password can be entered. Once the login screen appears, Keyboard still locked. Can enter some letters but most of them don’t work. Instead it only beeps. As a good engineer I carried another disk with me with another image. Put that in and …has the same problem. I entered a taxi to find a friendly PC dealer in the center of Kumasi who gave me an external USB-keyboard. At the time this was plugged in, everything, including the internal keyboard worked. Even after some reboot tests it seemed that the problem went away. So I went back to the hotel without buying a Keyboard. Bad decision! Once I booted the laptop in my hotel room I stuck with the same problem. Will get back to the store this evening and hopefully the USB Keyboard will help. Think I am losing another day for work and radio due to this problem. Fortunately I sent a first draft of my written work to our customer yesterday. To study it and prepare for discussion will keep them busy until tomorrow. Hopefully I will be back online until tomorrow. Also I uploaded my log to the online log which means that QSOs will not be lost even if my laptop never comes up again. But as always there is no such bad think which hasn’t anything good in it: in the PC shop I found the equipment required to enable our hotel implementing a wireless service for their customers. So I will go back with the hotel manager to buy the appropriate devices and then we can start to implement as soon as the local telecommunications company enables his DSL line. If that works out you probably see the online log beeing updated more frequently. But keep in mind, that in this most friendly country I have ever seen, “things come when they come”. So the internet connection :-). manged to wake up at 01:30am local time to go for som Ws but heavy rain during the whole night caused an S9+20 noise level. Not a single signal came through regardless of the band I tried. Will try another night. Today I learned that changing foreign money is not easy process. Tried 3 banks but they only service their customers. I ended up in a small Forex shop. There I have learned, that $115 not equals 115$. Banknotes of $20 are converted to 20 Ghanaian Cedis correctly. But 1 Dollar banknotes are converted to 0.7 Cedis. Discussion did not help. At the end I then tried to use their own ‚wappons‘: I asked them to change a 10 Cedi banknote to smaller 1 Cedi one. Then I said that they need to give me 12 of them because their value is just 0.7 due to the small banknotes :-)) Of course that didn’t work out but caused some laughing discussion in the office. In general it has to be mentioned, that Ghanaian are always very (very!) friendly people. They welcome everybody to their country and we are treaded with gread hospitallity. Also it’s a very save place to go. Uploaded another 300 Qs to the online log. By the way, we have about 300 to 500 additional visiors a day on our RRDXA website which makes us happy. If you leave a message in our guestbook we appreciate to see who visited us. We welcome everbody and if you want to join RRDXA feel free to register. We have no momebership fees but welcome erverybody interested in contesting and DXing. For any question contact Hand-Jürgen, DL1YFF oder Walter, DJ6QT. Working EU stations most of the times. In the afternoon JA is coming through with some nice signals. However, seems that many EU stations have no receivers. Once you send „JA only…“ it seems that half of EU feel like being JA for some reason. Worked very W’s so far. Need to stay up the second half of the night which I could not manage so far. May be on one of the remaining weekends. PLEASE: if I call JA … oder W … please don’t call if you are from EU. Help me to keep the rate up and give everybody else a chance. And again: please don’t call when you already have me on that band. Uploaded another 500 Qs to the online log so that you can check whether you made it into it. Stay tuned. I had some nice pile ups during the weekend, still concentrating on WARC bands. 40 works good during the night while 80 is giving me a hard time due to a 9+20 noise level. May be I have to mange to get up in the second half of the night to have better condx. Donwloaded W6EL propagation software which now gives me some better orientation on propagations. Could not manage to prepare in advance of my trip. Due to my weak signal it’s sometimes hard to get the first caller. If somebody puts me on the cluster then others wake up and we have good activity. So if you hear me I appreciate if you put a spot on a cluster. Just uploaded 2000 QSOs to our online log. First week is almost over. Station is working smoothly during my free time. Really amazed what nice job my new Expert 1KW amp is doing. Matching the G5RV perfectly on all bands. I would recommend to everybody heading out for DXpeditions. Can be carried in a rolly with handlugge (if your airline isn’t weighting your handluggage :-). Did concentrate on 30M +17M CW with some nice pile ups. Seems 9G is somewhat exotic on WARC. Got greetings and E-Mails from all over the world which is really fun. My colleagues are really amazed about my hobby and they cannot believe what they see when I am sitting in front of my radio. They seem rarely people being so dedicated to their hotel room :-). Today I tried with my friend Uli, DJ2YA the upper bands 15,12 and 10 and surprisingly we could do QSOS on all bands although the band seemed dead from my end. I then did CQ while Uli spotted me in the cluster….followed by 2 hours pile up on 12 and even 10 Meters. Worked fine until sunset. Then had to join my colleagues for dinner … in a restaurant where we have wireless internet access so I can post this one while smoking a shisha. Will try to be active during the upcoming weekend. Looking forward to work you. Will appreciate real RST reports. Please don’t call if you already worked me on that band. Uploaded my qsos which I did so far to our log engine. See the online log here. Have Business meetings the whole day. I could to another 200 QSOs on 17 and 30 Meter after dinner. Most signals quite week. Seems that my location is not the best one. Must leave my Spiderbeam at home due to space and weight limit. In the morning we had some free time and of course I started to look around for a good antenna spot. No issues with hotel management, they said “…you can put it wherever you want”. I found a water tank and put the 12m Spiderbeam fiber pole on top of it. Mounted the G5RV ….and went on air after 6 hours work. The I set up the station and I was surprised that the Expert 1KW amp worked just from the beginning on all bands with the G5RV. All bands work fine, at least it can handle to tune for fine SWR on all bands. I did some QSOs to test the equpment, first one with PR7PO on 20m CW followed by some QSOs on 18 MHz. Please be aware that I am here for business so I can not be on the bands for hours and hours. I might only be there sporadically, sometimes even for 10 minutes (between meetings or so). I’ll do my best but don’t be frustrated if I QRT just before you could make it. Generally I will concentrate on WARC bands when the conditions allow that. CW only. Stayed in Accra for one night an met Dr.Akoto, a local politician who helped me to get my license out of the communications authority. He did more than a dozen telephone calls and several personal visits…and finally he got the paper. I was happy to have a lunch with him and we had some interesting conversation about local business development. After a sight-seeing tour in Accra we started our trip to Kumasi. It was a 6 hours ride with a small bus. Went to our Guest House where we’ll stay for the next 4 weeks. I have had a smooth flight from Frankfurt to Accra. Luggage was accepted with no extra charge. Expert Amp went into my hand luggage. I hope that’ll work out also during the flight back home. In the evening I met my colleagues who flew in from India, US, Canada, UK and Italy. We enjoyed our first dinner in an African restaurant. Just about 12 hours to leave. Have just been told that my licence has been issued this evening (after month of pre-work and telefone calls, faxes, E-Mails). Will get the paper during the weekend when I stay in Accra. Whithout local help it would not have been possible to get the licence without visiting the local telecommunications authority. Luggage already loaded into the car. Will carry 40kg plus 25 kg hand-luggage :-). Will see how that works during checkin. Due to this heavy load I decided to leave the Spiderbeam at home. This would have been another 12 kg…. Hope I did not forget anything important (for sure I will…). Do not expect me to be qrv before Tuesday, 15th of July. That’s all for the moment. More info will be posted here.